Why WordPress added rel=”noopener noreferrer” ? I guess before removing them from your site you should know about them. I will present Pros and Cons of having them on your site. So in the end you can decide whether you want to remove them or keep them as it is. This tag was added to address a security vulnerability. The problem is with links having target=’_blank’ tag in them. If any link has target=’_blank’ the link gets open into new tab or window. The new tab or window has access to previous window as well. Note for sake of clarity we will use child window term for new window opened after link click. We will use parent window term for page which have the link on it. To solve this problem WordPress added rel=”noopener noreferrer” tag to links with target=’_blank”. Now lets see when WordPress adds rel=”noopener noreferrer” and target=’_blank’ to a link. For visitors looking for technical details on issue solved by this tag refer to this link. I am producing the below text from this link. When WordPress adds rel=”noopener noreferrer”? I have experienced couple of situations were WordPress added these tags. First one was quite obvious but second one was not expected. I will cover both the situations below. We all add links to our posts. The links can be internal or external. People prefer that new links are opened in new window or tab. So that reader are present on the original page as well. This is achieved by clicking open link in a new tab while adding or editing a link dialog. 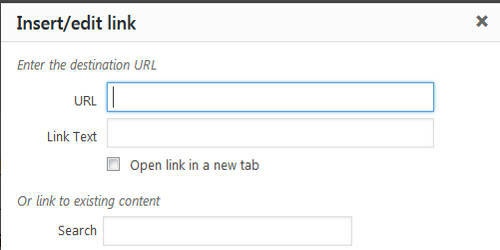 WordPress now by default adds rel=”noopener noreferrer” tag to all links (external or internal). Above one is expected behavior of WordPress. Now this one is unexpected. On my other site I use Amazon Affiliate network. Sometimes I use method described in first step to add affiliate link. Sometimes I paste the affiliate link (Amazon product link) directly on post. 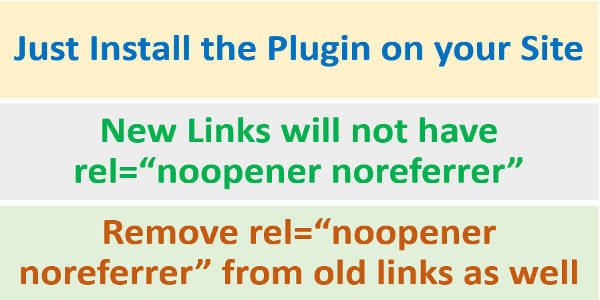 To my surprise WordPress automatically adds rel=”noopener noreferrer” tag to links directly pasted. On closer inspection I was able to understand reason of doing so. Amazon Product links always have target=’_blank’ tag in them. So it seems WordPress Editor looks for target=’_blank’ tag. If it finds any link with target=’_blank’ then it adds rel=”noopener noreferrer”. What are impacts of rel=”noopener noreferrer”? 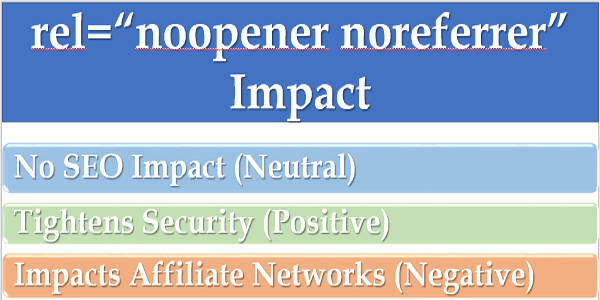 Below image summarizes impact of rel=”noopener noreferrer” . I will explain each of the impact in details as well. Above we discussed reason this tag was added. You also know when this tag is getting added. Now lets discuss if we should remove it or not. If this feature was added in WordPress then it should have some benefit. Also Drupal has plugin for it. Over the past few months, we have received a significant number of reports about a “reverse tabnabbing” attack, where a foreground tab opened from a trusted application, and displaying an attacker-controlled website, uses window.opener.location.assign() to replace the background tab with a malicious document. Unfortunately, we believe that this class of attacks is inherent to the current design of web browsers and can’t be meaningfully mitigated by any single website; in particular, clobbering the window.opener property limits one of the vectors, but still makes it easy to exploit the remaining ones. Now WordPress by adding this tag helps you eliminate window.opener property. But there are other ways attackers can exploit. There has been discussion on SEO impacts of this tag. Above you have seen views of Google on this issue. So there is no question of Google being bothered about this tag. Also this tag should not be confused with rel=”nofollow” or rel=”follow”. This tag has no relationship with rel=”follow” or rel=”nofollow”. So there will not be any impact on your site if you use this tag or does not use this. Above I mentioned that this tag was added into Amazon Affiliate links. rel=”noopener noreferrer” tag hides referral information if a link is clicked. So Amazon will not be able to know that referral came form your website. But it does not know if the link was placed on your site. Now You have to add your site on Amazon Affiliate account to get approved. So this lack of source may create problem. They may think that you are emailing users with your Affiliate link or using any other way of promoting the links. This is the very reason I will recommend removing this tag from your affiliate links. However there is no direct statement from Amazon. But you should not wait for your account to get banned. It is better to get rid of this tag. It is now solving some new problem. Above I have mentioned issue that this rel=”noopener noreferrer” causes with Amazon Affiliate account. But this tag may also impact other Affiliate Accounts which depend on source referrer information. So if you are using Affiliate networks on your website then it is better to remove this tag from your site. How to remove rel=”noopener noreferrer” ? Now that you have decided whether to keep or remove this tag on your site lets discuss ways to remove it from your WordPress site.There are two parts of removing this tag from your WordPress site. It automatically restricts WordPress from adding this tag to new links. So after installing this plugin no new links will have rel=”noopener noreferrer” tag. Also it removes this tag from all your existing link. Note this is the only plugin as of now which removes this tag from existing links. I have also releases a plugin on WordPress.org that removes this tag from new links. You just have to install the plugin and it works. Below is the link of the plugin. Open functions.php file of your theme in Editor. Was your site affected by this tag? Feel free to share your thoughts. 3 comments How to remove rel=”noopener noreferrer” from WordPress? Why your code given in the Method 3 have your blog name in the code itself??? Why not just give a code without any reference to you? Nice Info. I would like to understand more.